Oman is one of the prominent gulf country situated in at the entrance of Gulf region. This GCC member country is one of the richest in the region and has a handsome amount of petrol that steer their growing economy. Oman and India have a healthy international relationship and the trade between 2 countries begin from the very early 300 BC. Oman used to sell their products in India, they were Gujarat and Malabar region. Later on, a lot of migration happened from India to Oman, especially from the Malabar region. As the nations progressed, immigration rules are also developed to international standard and certificate attestation become necessary for immigration from one country to another. Employment Visa Attestation, Family Visa Attestation, Experience Certificate Attestation, Mark Sheet Attestation, etc become important for concerned immigration requests. However, for all migrants who are living in Oman can attest the certificate from Oman itself. Here we are explaining a few Oman certificate attestation procedures that issued by Oman government. Those who are already living in Oman can obtain the certificate attestation from Oman government itself. Education certificate attestation is one of the most required attestations since it is required for most employment visas. Before the submission of request please make sure all your details in mark sheets are correctly maintained so it could not block you from further attestation proceedings. Have your certificate collected from the corresponding university in Oman and make sure your details are correctly maintained in the certificate. All the educational certificates from schools, colleges universities and private institutions of Oman comes under the Ministry of Education. Copy of your passport is mandatory to prove your national identity. Passport is the only agreed international identification card, hence it is important to produce passport copy for attestation services. The initial step is to produce an educational certificate before the ministry of education for their attestation. They will pass it to the ground level checking and their official will connect with the concerned university or institute. Based on the input and verification from the educational institute, the investigation officer will record a report and will submit to the ministry of education. After reviewing the report, the ministry of education will perform the mark sheet attestation and will send it to the Ministry of foreign affairs. The attestation from Ministry of Education will be the reference for Ministry of foreign affairs as the investigation was performed at ground level. After receiving the attested certificate from Oman ministry of education, MOFA will check the Oman certificate attestation details and report in order to find the credibility of the certificate. Once the certificate credibility has identified, MOFA attestation will be performed by the Oman Ministry of Foreign Affairs. Completion of MOFA attestation will be considered as the approval for using the document all over Oman for the relevant requirements. Here we are talking about the marriage certificate holders who tied their knot in Oman. Being an immigrant, attesting the marriage certificate is important as they need an attested certificate to continue their married life. Here we are discussing about the marriage certificate attestation of the couple who happened to be married in Oman. All marriage certificates are issued by the court of Oman or the Embassy of Oman. Collect your Marriage Certificate from the ministry of justice and make sure the details are correct. The initial attestation should be initiated by the certificate holder itself and the should approach Ministry of justice for their attestation. They will check the details of the certificate and will attest the certificate and give back to the certificate holder. Certificate holder will have to pass it to the concerned embassy for further certificate attestation. If the certificate holder is from India, It would be Indian embassy certificate attestation. Once the certificate is attested by the ministry of justice certificate holder can submit the certificate to the concerned embassy for embassy attestation. The embassy will check the remark and attestation details of the certificate for validating the credibility. Once they confirm the genuinity of the certificate as per their rules, the embassy will attest the certificate and pass it on to the Ministry of external affairs for further attestation procedure. After the attestation from Embassy, MOFA will receive the certificate and they will verify the embassy attestation and ministry of justice attestation for checking the credibility. After the verification, the ministry of foreign affairs attestation will be performed by MOFA. Birth certificate attestation is mandatory for immigrants even if they are leaving in Oman. Basically, the attestation needs to be done for the kid who born in Oman for immigration formalities. After obtaining the birth certificate, the certificate can be attested from Oman itself. Birth certificates in Oman are issued by Oman Ministry of Health Department. Birth certificate of your kid or concerned person should present and all detail should be correct in it. The birth certificate can be collected from the Oman Ministry of Health. After obtaining the correct birth certificate, certificate holder or their parent can approach the ministry of health for the birth certificate attestation. Ministry of health will check the document and will do an internal checking to confirm the certificate genuinity. Once the credibility of the certificate is confirmed, they will attest the certificate and will give it back to the certificate holder. He can process the certificate with the ministry of foreign affairs for the final stage of Oman certificate attestation procedure. This is the final stage of certificate attestation and after receiving the certificate from Oman Ministry of Health, MOFA will check the credibility of the certificate and based on their check, will attest the certificate. This attestation from MOFA will declare the certificate as valid all over Oman. As the day progresses, travelling from one country to another one is increasing rapidly due to globalization. During this increasing travelling trends, following up for the attestation services will be a lot more difficult for a common man. All you need is a reliable and Professional Attestation Services like NEW INDIA Attestation that can offer the Best Attestation Services at reasonable Attestation Charges. Attestation Agencies should work as per Certificate Attestation Rules and can also perform Fast Certificate Attestation and Urgent Certificate Attestation. Here in this blog we mentioned about the Oman certificate attestation procedure. 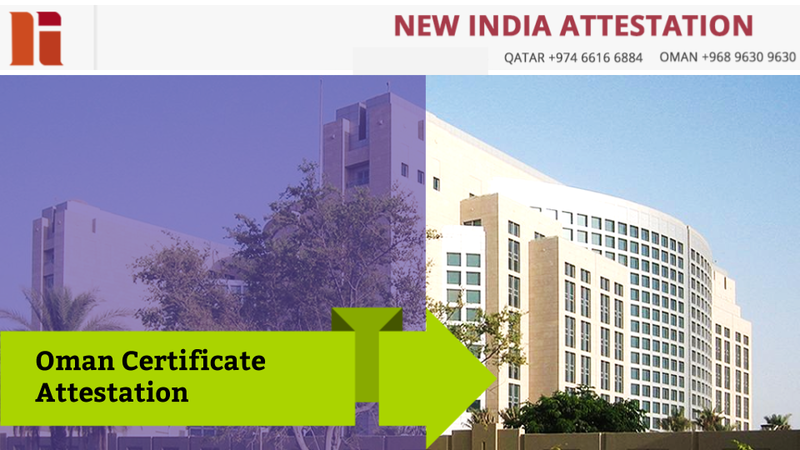 New India provides the best certificate attestation services across GCC along with a vast experience in the attestation service field.